Rajah Hotel Bangkok is located on Sukhumvit road, and it is an ideal place to stay if you wish to explore Bangkok. This hotel is known for its extremely friendly staff, nice breakfast and clean rooms. You can also find various shops, massage centers and places of interest in the vicinity. Rajah Hotel Bangkok is a 3-star property in Bangkok that never fails to charm its guests. With stylish accommodation in the heart of Bangkok, the hotel offers a comfortable shelter for couples/honeymooners looking for a wonderful holiday. Rajah Hotel features an outdoor pool, a restaurant and massage service for its guests to relax and enjoy their holiday. Leisure facilities in Rajah Hotel include a nightclub and an outdoor swimming pool.The hotel also boasts of its attractive design and modern-day amenities. Further, its warm hospitality and incomparable amenities helps offer memories for the lifetime. 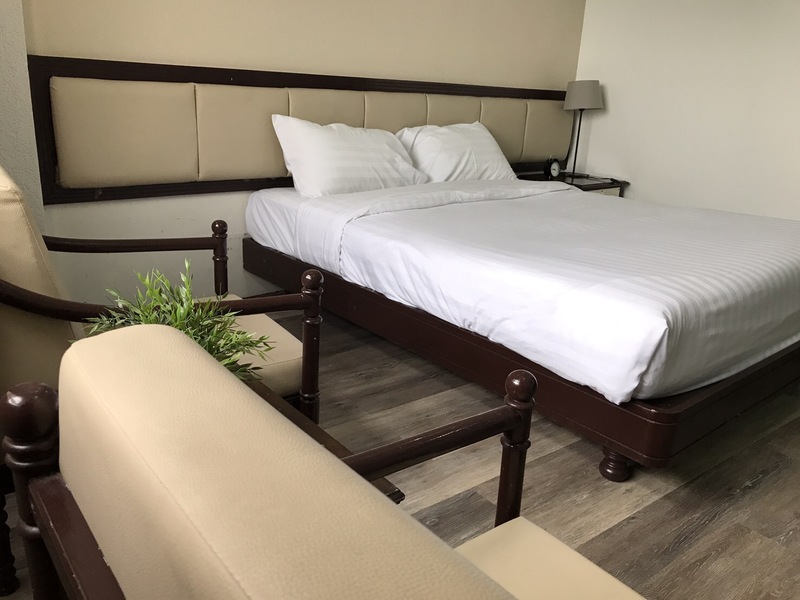 Its proximity to the nearby tourist attractions like Soi Cowboy, Temple of the Golden Mount, Bangkok City Pillar, Grand Palace and public transport terminals makes it the right choice to explore around the city Bangkok. Don Muang Airport is 21 km from this property, while it is 27 km to reach Suvarnabhumi Airport. Rajah Hotel with friendly staff has a total of 44 rooms carefully decorated in a very traditional manner. It offers rooms under three categories, including double bedroom, twin bedroom and a luxury suite. Each guestroom boasts the city view to be enjoyed by the guests. Moreover, the suites at the hotel come with a spacious balcony. All the rooms are equipped with TV sets, a mini-bar, climate control, a personal safe and a seating area desk, en suite bathroom supplied with bathtub, a shower and free toiletries, as well as free Wi-Fi. Rajah Hotel Bangkok proudly boasts of outdoor pool and massage service. It also features a restaurant on the hotel premises and mini-bar at every guestroom for the convenience of the guests. Besides, Rajah Hotel maintains a parking area, 24-hour front desk, room service and a terrace restaurant. All the hotel rooms are equipped with air conditioning and complimentary Wi-Fi. It also offers laundry, luggage storage, daily maid service, and concierge service. The hotel offers a safe deposit box, an elevator and a gift shop . Further, guests are provided opportunities for massage and evening entertainment. Rajah Hotel Bangkok features an exceptional restaurant and bar offering delightful culinary experiences throughout the day and the ideal settings for the night. Rajah Hotel maintains a restaurant and a bar. Serving Thai and international cuisine, the on-site restaurant and bar also cater for a collection of beverage. Guests can have breakfast in the restaurant every morning. Further, one can gorge on appetizing food with a glass of wine at the restaurant, which remains open for lunch and dinner. Moreover, it serves an array of cocktails for the food lovers. Alternatively, guests can find a large number of dining options in the hotel's neighborhood. While surrendering oneself to the tranquillity of the place, let go all the stress and anxieties and indulge in a range of well-being arranged by Rajah Hotel Bangkok. Evening entertainment is likely to engage one in an entertaining mood. Also, Rajah Hotel is known for striking the right balance between lavishness with contemporary richness. Rajah Hotel is located around 20.8 km drive from Don Mueang International Airport. What are the business facilities that the hotel offers? The business facilities that Rajah Hotel offers are fax and photocopying. Does the hotel provide Wi-Fi in all the areas? Yes, the hotel provides Wi-Fi in all the areas. Is there any mini market in the hotel? Yes, Rajah Hotel has a mini market on site. What are the languages those spoken in the hotel? The languages those are spoken in the hotel are Thai and English. Set at the heart of Bangkok, Rajah Hotel is a perfect place for nature lovers! Here, experience the beauty of the city and find solace while being surrounded by vibrant greenery and soothing ambience. Rajah Hotel is also known for offering warm hospitality with friendly staff. One can enjoy stunning views of the city from most of the rooms. Whether its a massage treatment, or an evening entertainment, the guests have endless ways to unwind. Get a taste of authentic local Thai cuisine made from the freshest ingredients in the restaurant. Further, the guests can enjoy their time at the terrace or the garden. The adults can enjoy at the hotels bar to experience the nightlife of the place. Khlong Toei is a great choice for travelers interested in nightlife and shopping. Whether relishing an exquisite meal at the hotel restaurant or witnessing the remarkable city view, Rajah Hotel ensures that its guests get an exclusive slice of paradise.